This workshop is designed to be an immersive experience and will begin at 9:00am and conclude by 8:00pm each day. Multiple breaks will be provided along with excellent meals. Michael K Sahota’s “Agile” Culture & Leadership Training is an intense 2 days of deep exploration into leadership, organizational growth and culture to deliver high performance organizations. You will get the Certified Agile Leadership (CAL 1) credential from the Scrum Alliance when you complete it. Michael K Sahota’s CAL 2 is a continuation and extension of the Sahota CAL 1. It is a deep dive into the concepts of the Sahota CAL1 that includes practical role-playing experiences and advanced personal growth skills. It also covers additional material that builds on CAL1 around organizational evolution and high performance. It consists of a 3 day in person training/workshop followed by a 4-month integration program. The training is an intense 3 days of deep exploration into leadership, organizational growth and the connection of culture to high performance organizations. During this experience, participants will undergo a process of letting go of existing behaviours that block their abilities to be an effective leader. You will learn how to master the playbook you learned in the Sahota CAL1 and take it to a deeper level. Note: You need to have completed Michael K Sahota’s CAL1 to take the Sahota CAL2 as it builds on specific material only taught in his CAL1. Accelerate your Leadership journey with Personal Agility, a simple framework that helps you visualize, prioritize, and do more of what matters in your life while staying accountable to what you want to achieve. 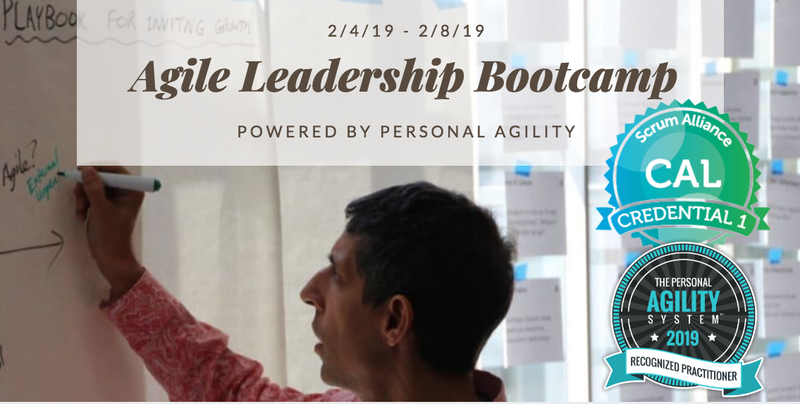 We will cover the core principles and foundations of Personal Agility throughout this Leadership bootcamp and you will also gain access to the online portal with support for the next 4 weeks following the course. After applying Personal Agility for 4 weeks, you can fill out the Recognized Practitioner application and schedule a coaching call to become a Personal Agility Recognized Practitioner. This workshop has been led for practitioners around the world with locations including Italy, Germany, Switzerland, India, Canada, and throughout the U.S. Feedback. CAL1 + Personal Agility – While we highly recommend taking CAL1 + CAL2 this week, you are welcome to sign up for just CAL1 which will be the first 2 days infused with the Personal Agility content as well. CAL2 + Personal Agility – If you have already taken CAL1 from Michael Sahota and are interested in CAL2, you may want to select this option which will be 3 days of CAL2 infused with Personal Agility. We do highly recommend attending the full week for a refresher of CAL1 which you may attend at 50% off (please contact maria@formulaink.com for this discount code). CAL1 + CAL2 + Personal Agility – This is the most recommended package for the leader wanting to supercharge your journey of personal growth. The first two days will consist of CAL1, while the second part of the week (3 days) will be a deeper dive into the CAL2 content. Each day will be infused with Personal Agility principles and application for greater enhancement of your leadership journey. Michael believes people deliver astounding results when they have Passion and Purpose, Joy and Meaning, Creativity, Safety, Trust and Belonging. He believes we can foster work environments where people can grow and evolve to unleash their best every day. Michael helps people cultivate their organizational culture, invite a more conscious way of being and relating, and evolve organizational structures and practices that foster new ways of working. As a guide, Michael helps leaders navigate the world of organizational reinvention, supports learning and growth through: training, coaching, consulting, and facilitation. Michael focuses on increasing awareness of the connection between actions and outcomes, regularly inviting change, and he always walks the talk. Maria Matarelli, an Agile Coach and Certified Scrum Trainer (CST), is passionate about helping people reach a level of higher performance. While training leaders and teams around the world, Maria has noticed how powerful and essential the Agile Leadership principles are for true Agility. After attending four CAL1 trainings and CAL2 while applying the Sahota Playbook, Maria realized how important these practices are for people and organizations. While also exploring the application of the Personal Agility framework to her own life, Maria discovered how easily these two areas compliment each other for supergrowth in your own Leadership journey. Maria travels to consult businesses and speak at conferences from Vancouver to Morocco, Sweden, New York, Hawaii, Istanbul and many other locations and has built a team of experienced, certified trainers and consultants available to guide people and organizations through achieving performance on a new level.